Sifu Gorden Lu is the son of the legendary Master Lo Man Kam who was Yip Man’s nephew and student. He was born in Taiwan in 1971 and began his Wing Chun training at the age of 15 under the tutelage of his father. He soon realized that the art of Wing Chun was his calling and started training diligently. 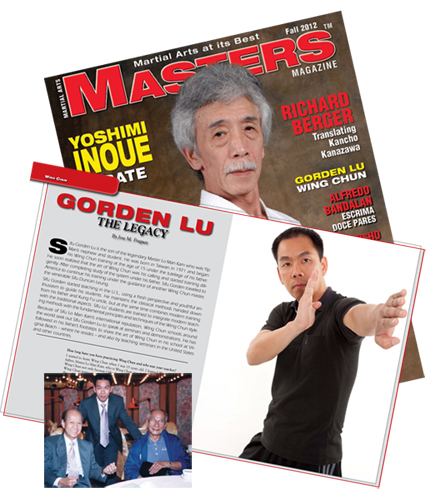 After completing study of the system under his father, Sifu Gorden traveled to America to continue his training under the guidance of another Wing Chun master, the venerable Sifu Duncan Leung. Sifu Gorden started teaching in the U.S., using a fresh perspective and youthful enthusiasm to guide his students. He maintains the classical methods handed down from his father and Kung Fu uncle, but at the same time combines modern training with the traditional aspects. Sifu Lu’ students are trained to integrate modern teaching methods with the fundamental principles and techniques of the Wing Chun style. Because of Sifu Lo Man Kam’s international reputation, Wing Chun schools around the world seek out Sifu Gorden Lu to speak at seminars and demonstrations. He has followed in his father’s footsteps to share the art of Wing Chun in his school at Virginia Beach – where he resides – and also by teaching seminars in the United States and other countries. How long have you been practicing Wing Chun and who was your teacher? I started to learn Wing Chun when I was 15 years old. I learned Wing Chun from my father, Master Lo Man Kam, who is Wing Chun grandmaster Ip Man’s nephew. I studied Wing Chun not only because I like the art, but also as a personal mission for me, to keep Wing Chun instruction direct from the family and to follow the family tradition. Since the early 80s, there had some exchange training between my father’s school students and Sifu Duncan Leung’s school. 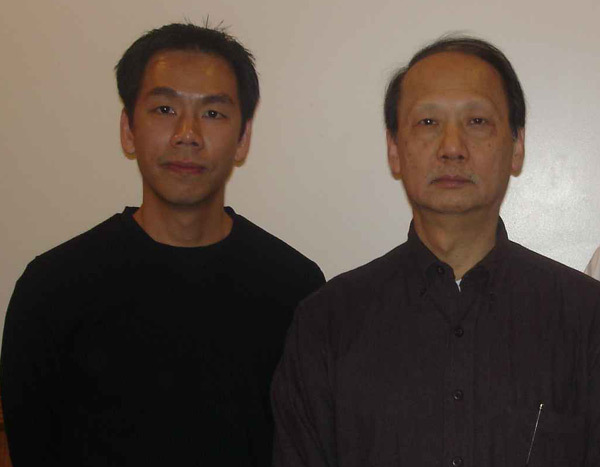 In 1994 summer, I followed my father’s instruction and traveled to the U.S. to study another style of Wing Chun from his junior Kung Fu brother Sifu Duncan Leung, the disciple of the grandmaster. So I really had two major instructors, both my father Master Lo Man Kam and Sifu Duncan Leung. What are the main principles intrinsic to the three Wing Chun forms? Do they interrelate with each other? There are many details and ideas in each Wing Chun form, but there always are a few key things that represent each form that the practitioner needs to pay more attention to. Siu Lim Tao is most important form of whole system. The form doesn’t just teach the hand movements and structures. The most important is to let practitioners know the idea behind each move. There are some main ideas I want to point out here: the idea of how to generate elbow power, center line concept, straight line theory, and the idea of covering the upper body center area are in the first section of the form. The fighting range and speed are in the second section, and the last section teaches how to generate power in a short distance, relaxation power, pull and push power idea. Chum Kiu emphasizes footwork, kicks, mobility and hand leg coordination. Chum Kiu also uses a lot of principles and the movements from Siu Lim Tao (for example: center line, pull and push power, idea of protection, etc.). 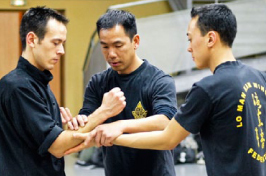 Chum Kiu also expands the ideas of using the movements from the first form to be a technique or a way of application in a close-range fighting. Chum Kiu in English is “seeking the bridge.” That is why this form has a lot of movements with idea of “intercepting.” Intercepting your opponent’s hand technique will build a bridge. Bil Jee is unique form and a lot different from the first two forms. The first form (Siu Lim Tao) teaches how to generate the power from the elbow. The third form (Bil Jee) teaches how to generate and extend the power from the shoulder. The third form also combined the first two forms’ ideas, hand movements, and footwork, and emphasizes open and longer fighting distance applications. Fa-sao in the third form can very effective by covering a wider area; the elbow exercise not only trains you to know how to extend the shoulder but also is a powerful strike and cover technique. Shooting the fingers to the opponent’s soft point is the trademark. This technique requires accuracy, speed, extension, and penetration. The first form is more abstract and needs a lot of understanding and imagination. Most movements are teaching the position, structure, and the ideas behind the move. The second and third form have more applications techniques involved. The second form contains a lot of controlling techniques. It provides close fighting range concept, generating the pressure power by stepping in, turning the horse and fighting direction. The third form also emphasizes covering a wider range, pull and push power and distance control, and concentrating on accuracy of finger and elbow strikes techniques. How has your personal Kung Fu has developed over the years? I learned from my father who is an expert on the short bridge Wing Chun, I also learned from my Kung Fu uncle sifu Duncan Leung and who is an expert on long bridge Wing Chun. I was in Taiwanese army Martial Arts and sports team. I worked for the Taiwanese police force as defensive tactics instructor. During those years of learning, practicing, training and developing, I did develop my personal style in the system. So when I use and teach the art, I have a broader experience and background than other people. I utilize Wing Chun system short and long bridge fighting techniques in a more complete way and bring these other areas of experience to the table as well, so my students gain access to this more flexible approach. In addition to the short and long bridge styles, I also learned how to teach these two styles by following Ip Man’s teaching curriculum and that is the biggest difference to most people who teach in the current time that they only emphasize one style. Finally, my experience with modern sports theory inspired me to adapt these types of approaches in training my students in Wing Chun. I try to use the sports theories in developing the supporting exercises to give my students an advantage in learning Wing Chun in the shortest period of time to reach the same high quality. How different from other Kung Fu styles do you see the principles and concepts of Wing Chun? Other Kung Fu teaches how to fight from the form, copy the moves from the animals, religion ceremony … imagination (like fire, water, earth, wood, and metal – five elements), etc.… In Wing Chun, we learn how to fight by the principle; we see scientific effects in the system and the movements that we practice use the natural reaction (such as dodge the ball, kick the ball, push a car, slam the door, draw the hand back fast when get burned by the cigarette, etc.) People are born with those basic skills, which mean you don’t need to learn you already know and have muscle memory to react fast. In Wing Chun, we just use all those thing plus Wing Chun principles of movement to apply fighting techniques. That’s why people always say Wing Chun use a lot of economy motion and it is very easy to learn. Do you think that Kung Fu in the West is at the same the technical level as in China? I am not sure about other styles of Kung Fu, but in Wing Chun most are not. There are few reasons: Geographically, most Ip Man students are not teaching in the West. There are some students of Ip Man and some people who may have good Wing Chun knowledge from Taiwan, Hong Kong or China who came to the West, but the amount is still small. The area of whole United States compared to the amount of people who have good knowledge of Wing Chun from the East that will take a lot of longer to develop this art to the same level over there. Culturally, Taiwan, Hong Kong or China, still have many Kung Fu schools that are following the tradition. Most people and potential students know learning Martial Arts take years and not everyone can be good or a master. Traditionally, even after years of study, if your Sifu does not say you are good enough to teach or prove, you should not teach or open the school, the students will not disobey. This is also is how the students show loyalty and respect to the Sifu, school and the art. This also is the best way to maintain a good quality of Kung Fu and better skills and knowledge to pass down to next generation. I have heard many stories and people talked about someone who learned Wing Chun for a year or two or 10 months or less and then opened a school in the West. Or some people maybe learn few years but never learn how to teach. Some people learn from DVD or went to a seminar for few hours then said they are good enough to teach those masters’ Wing Chun and using their names. A lot of moves and techniques may be easy to copy but it is hard to be an expert. If you don’t understand or if someone not tells you correctly the lesson behind the technique or exercise or you are not really focus on some details, and then you will have huge gaps. A little mistake you make now in the technique or principles after years of practice will be big mistake. This is like shooting a rifle. If you miss focus on the center of target just a little bit off the mark but after 100 yards you will find out you missed the target by a lot. How do you see Wing Chun Kung Fu in the world at the present time? Every time I travel to different countries to do seminars, I see more and more new students studying Wing Chun. I also notice a lot of people enjoying the study Wing Chun, not because of the fighting techniques alone but also due to the art itself. Wing Chun has already been popular for years and many people are still interested in it for its emphasis on traditional training, not “fast-food Kung Fu.” I think this is a good sign and I also have positive view on Wing Chun for the future. Does the weaponry aspect of Wing Chun [long pole and butterfly knives] enhance the student’s empty hands ability or are those two completely non-related skills? There are many stories about Wing Chun weapons. Some people say the knives are arms extensions, others say they are two different things. 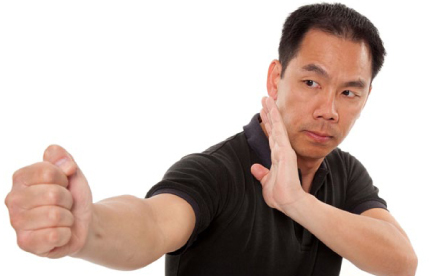 Wing Chun originally had no weapons. It does not matter which one is right or wrong; from what I know, the knives training can enhance empty hands’ flexibility and strength because a lot of knife movements copy the hand techniques and Wing Chun principles. The Wing Chun long pole is longer than most other Chinese Kung Fu styles’ pole or stick, so the Wing Chun pole is also heavier. If students practice the long pole form a lot, that can easily stronger on their arms, footwork and structure. Long pole also has a lot of unique exercise along with. When we do those exercises, we can use an 11-foot-long pole to train to give better power training and those long pole exercises are very good to the horse (leg power), footwork, hip power and Wing Chun punch. All these power training can always benefit the empty hands. How does the Wing Chun style differ from other Kung Fu methods when applying the techniques in self-defense and real situations? I think the big difference goes two ways. The first thing is that other styles fight “by technique” and Wing Chun teaches how to fight by theories such like shortest distance between two points or simultaneously cover and attack. In Wing Chun we don’t learn how to hit. We learn how to not get hit. We always cover our opening and make sure we are safe and control the situation then hit back. Second, we use a lot of natural reactions (something you born with and you don’t need to learn or train), scientific effects (such like leverage: a lot of thing you may already learned in 5th grade), etc… in fact, a lot of the things I point out here, people don’t really need to learn from Wing Chun, because they already know those ideas, or can do those movements in their regular live. The main thing they don’t know is how to put everything together to be fighting technique. Wing Chun system just provide this training, so people who learn Wing Chun may not need to spend a lot of time then they can easier hands on and apply to situation. That’s why in Wing Chun we have a saying is “the best technique is no technique,” which mean you just react to the situation without thinking for it. Other styles may learn how to fight from the forms or katas, or emphasize punching the bag or kicking the bag a lot every day, or need to learn the movements from the animals which may not the natural for humans. Sometimes, to practice those movements may take longer time because those whole new movements our muscles are never experience before or very limited and may need to take longer time to be good and turn to natural reaction or muscle memory. From my point of view, Wing Chun is like any other Martial Arts style; they all have something special and unique. In Wing Chun system, which just design to let practitioner easier to react and fit into the situation. What is your opinion about mixing Kung Fu styles? Does the practice of one nullify the effectiveness of the other or on the contrary, it can be beneficial to the student? This is a matter of opinion, but for me, I would say that if you truly want to master Wing Chun then you should not mix styles because there are too many conflicts. For example, a lot of Chinese Kung Fu they learn to fight from the form the animals or imagination, we don’t. Wing Chun is very abstract. We learn to fight from the theories. Other styles may emphasize hard power but Wing Chun can be hard or soft depending on opponent and situation. From my teaching experience, students who learn different styles at same time, a lot of time they will miss focus in the classes, confuse themselves with different techniques, find a lot of conflict and finally never master any style. Wing Chun is very flexible and sometimes is very easy to adapt to other styles. You may not need to really learn the style, you just need to learn right techniques and you may open your mind and increase your skills on both ways. What are your thoughts on the future of the art and, is there anything you would like to add? I believe the future is great for Wing Chun. It has become increasingly popular and more well-known to a greater audience. This is very good as the system spreads and more people want to learn, want to experience and find out the truth of Wing Chun… its history and techniques. On the other hand, as it gains in popularity I worry about the Wing Chun instruction becoming so commercial that ends up ruining both the name and quality of Wing Chun. There is always a worry as to authenticity and quality control… first hand instruction versus someone who learned from a video or few seminars or someone who are not fully versed in the art. The very best instruction comes from people who live and breathe Wing Chun. Lineage, training background and many years of instruction in Wing Chun are the most important. 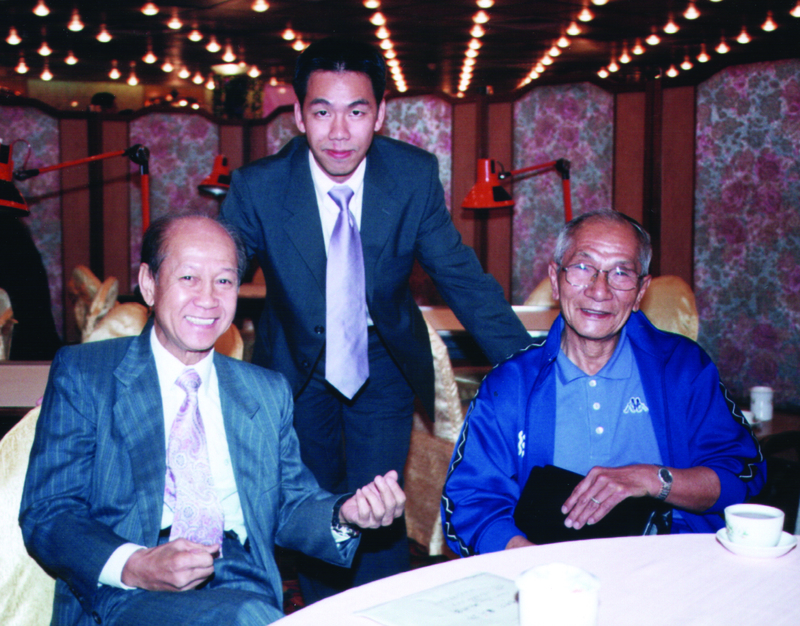 Posing with two legendary Wing Chun masters; his father Lo Man Kam (L) and uncle Ip Chun (R).